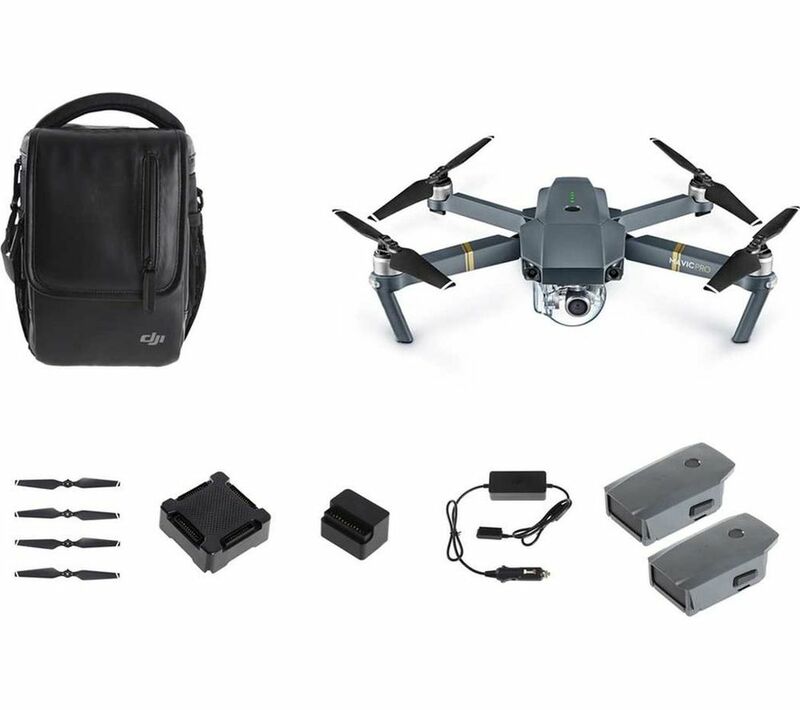 Overview & specs of Dji Mavic Pro Drone and Accessories Bundle by Currys PC World. Top features: - Fly further thanks to an incredible 4.3 mile range - Fly more combo set includes everything you need for day trips - Hassle free flight with SkyAutonomy technology - Fly in areas without GPS thanks to vision sensors - Fly for longer with a flight time of up to 27 minutes - Capture superb quality 4K quality video at 30 frames per second Fly further The DJI Mavic Pro Drone features OcuSync transmission technology to let you fly even further. An incredible 4.3 mile range lets you explore further out, and capture more than ever using its integrated camera.Fly More ComboWith everything you need to keep on flying this Fly More Combo set is ideal for a day out flying. The set includes a shoulder bag, additional batteries, and a handy power bank adapter and car charger so you can recharge on the move.Hassle free flightSkyAutonomy technology helps the drone avoid all obstacles during long distance flights, or when descending during Return to Home mode. The Mavic Pro can sense obstacles up to 15 metres away to prevent accidents when flying for a hassle-free flight.Fly in areas without GPSAdvanced satellite positioning helps the drone position itself and lets you know where it is at all times using GPS technology. The Mavic Pro can even fly in areas without GPS such as indoor locations thanks to forward and downward vision sensors to let you fly almost anywhere.Fly for longerFly for longer. The Mavic Pro can reach a maximum 27 minute flight time, and fly a distance of up eight miles thanks to its powerful, high efficiency motors that can fly at a maximum speed of up to 40 miles per hour.When you're done, the drone neatly folds into a compact size small enough to store in your backpack. You can even fly it using your iOS or Android smartphone for a quick flight whenever you fancy.Shoot in 4K Ultra HDRecord video like the pros in stunning 4K Ultra HD quality at a smooth 30 frames per second. An axis gimbal further helps to stabilise the camera at high speeds for the best sweeping panoramic shots.With ActiveTrack and Trace modes you can have the drone follow behind or in front of a moving subject, fly alongside it, or have the camera trained on an object while flying high above for a dramatic bird's eye effect. No shot is impossible.___________________________________________Please note: when flying a drone in the UK you must follow The Drone Code as set out by The Civil Aviation Authority (CAA). For more information visit dronesafe.uk. Do not fly your drone within 1 km of an airport or airfield. We are comparing prices for Dji Mavic Pro Drone and Accessories Bundle in new condition sold by Currys Pc World.